Of Mind and Matter analyzes identity formation in the multicultural border region of Sleswig. It highlights the changeability of national sentiments and explores what has motivated local inhabitants to define themselves as Germans or Danes. 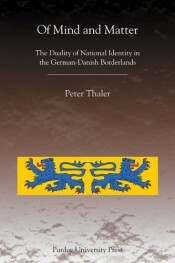 The analysis focuses especially on the respective national minorities, among whom the transitional and flexible aspects of Sleswig identity surface most clearly. The study investigates national sentiments in a border region from a theoretical and comparative perspective. It relies on diverse forms of historical evidence, including quantitative sources such as language statistics and election results, but also more subjective sources such as personal life stories and interviews. The study pays equal attention to German and Danish source material. Of Mind and Matter adds important new angles to the literature on national identity in border areas and fills a conspicuous gap in English-language historiography, which completely lacks modern analyses of Sleswig history. Peter Thaler is associate professor of history at the University of Southern Denmark. He holds a Ph.D. in history and a Ph.D. in Scandinavian studies from the University of Minnesota, as well as, a doctorate of law from the University of Vienna.